It’s been about six weeks since I wrote about the Smart Keyboard, so I thought it was about time to post an update on the medium-term experience. I won’t discuss the general typing details, but rather focus on the smaller stuff that you can only glean after an extended period with a device. This was the thing I was most worried about when the Smart Keyboard came out. I saw Harry McCracken’s tweet about the paint on his keys wearing off and worried that the same would happen to mine. This wouldn’t necessarily be a big deal if this were a conventional keyboard with plastic key caps, but the Smart Keyboard isn’t repairable. Any damage done to the keys would require a complete replacement, and those were very hard to come by during the holiday season. Fortunately, I really have nothing to report on this front, and no news is good news as far as durability is concerned. All of my keys are still in the same condition: none of them feel lose, and they still respond to contact evenly, regardless of where you hit the key (which is one of my favourite features of this keyboard). I am seeing a few more distinct oil stains, but I expect to see that on any keyboard, and it’s less evident on the fabric keys than it would be on plastic key caps. The rest of the cover is still perfect. Despite sharing a bag with my camera (with some jagged edges from my camera clip), there’s no obvious scarring on the polyurethane front cover. It’s still soft to the touch, and grippy enough that I can place the iPad cover-side-down on my tilted MacBook stand without it slipping. What has taken some getting used to is wiping off crumbs from the microfibre interior before packing everything up. The same surface that rests against the screen is the same one that faces the table when the keyboard is set up, so this area does require some brushing down every now and then. When you first see how the Smart Keyboard unfolds, it can be a little intimidating. Unlike the three panel design of a Smart Cover, the Smart Keyboard has four panels — the last of which actually folds out of the others. It’s a lot like watching a Transformers movie, where you’ll want to rewind or watch things in slow motion to see exactly how things unfold. The good news is that you do quickly get used to this. I usually start by lifting the iPad Pro above the table, unfolding the Smart Keyboard with one hand, and setting the keyboard panel down on the table. After that I’ll place m the iPad Pro into the keyboard’s magnetic catch while the rest of the cover folds itself into a triangular stand behind it. The whole process takes about three seconds from the moment I remove the iPad Pro from my bag. I’d say the only real change from other keyboards I’ve used is the amount of space the Smart Keyboard needs. The iPad Air 2 could easily blend in on a desk alongside a PC keyboard and mouse, but the combination of the Pro’s screen and the full-width keyboard are impossible to ignore. 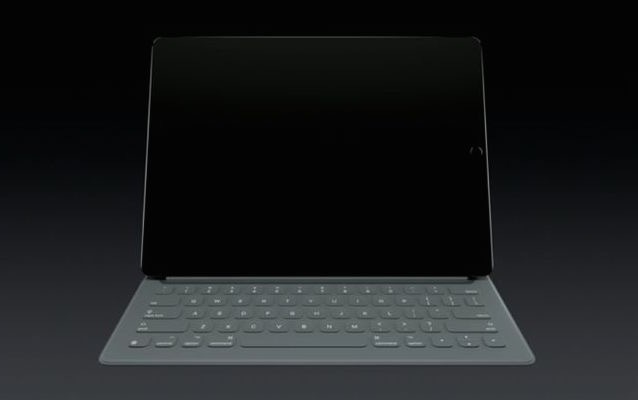 Previously it was an iPad and/or computer on the desk, but the size of the Smart Keyboard changes that to iPad Pro or computer. If you like using your iPad at a desk, you’ll want to fold the Smart Keyboard up into its viewing angle to actually have some desk to use. I don’t really miss the brightness shortcuts on my iPad Pro, but I do miss the volume and playback buttons. You can use Control Center for these things, but a slide-up touchscreen controller isn’t nearly as immediate as a dedicated key or keyboard shortcut. Apple is still adding more keyboard shortcuts as of iOS 9.3, so I do have hope. That said, as much as keyboard shortcuts have improved, there are definitely still some silly, silly keyboard bugs. Occasionally I can switch back to iMessage and am unable to type until I kill the app and come back to it. The app switcher and Home shortcut can also occasionally cease to function. This doesn’t happen often enough to keep me from working, but the fact that it’s still happening is a little ridiculous. iOS also seems to handle the Smart Keyboard a lot like the built-in software keyboard. It’s vulnerable to auto correction typos at times, and it can be a real pain about the Shift key. A real keyboard would only capital is a letter while the shift key was held down (or the Caps Lock was activated), but iOS insists on treating the Shift key of the Smart Keyboard as a modal switch (“tap to capitalize”), and this can quickly put you at odds with autocorrect. If you’re experiencing this issue, it’s probably a good idea to go to Settings -> General -> Keyboard and turning Auto Capitalization off. It may save a lot of premature gray hairs. On the hardware side, the Smart Keyboard is pretty reliable. 99% of the time I dock it, its immediately ready to go. There are only a few instances where the iPad Pro needs to be reseated for the keys to work. Frankly, I’m still a little embarrassed by how much I paid for a Smart Keyboard. I think it’s a great accessory, but I do think the pricing is ludicrous, even given the Pro moniker of this 13″ iPad. I’ve had killer gaming keyboards and mice that have worked for a decade, and which still cost less. However, there’s just nothing else on the market that does what this keyboard can do in as small a package. I really value the thinness and lightness of the Pro, and this keyboard provides functionality and protection without sacrificing on the core mobility of my tablet. So even though this Smart Keyboard is a ridiculously pricey purchase, I’m glad it’s holding up so very well. I see your point, David. I think in this case I don’t tend to miss the dictation whole my iPad is attached because I’m usually sitting down to write. If I’m relaxing and watching, I’ll usually place the iPad Pro in the viewing angle, at which point the software keyboard will pop up. It is an oversight that there’s only one way to activate dictation though. Definitely. Fan mail. I found this blog, like all your work, informative and engaging. Thanks.